THEMIS accomplishes these tasks by employing 5 identically-instrumented spacecraft in carefully chosen orbits whose apogees line up once every 4 days over a dedicated array of ground observatories located in Canada and the northern United States. Three inner probes ~10 Earth radii (RE) from Earth monitor current disruption onset, while two outer probes at 20 and 30RE remotely monitor plasma acceleration due to lobe flux dissipation. Magnetic field lines map phenomena occurring at the inner spacecraft to the ground arrays, where they can be observed as nightside auroral displays and geomagnetic perturbations. 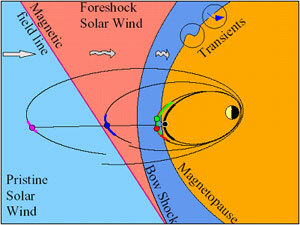 The array of spacecraft and ground observations will enable researchers to pinpoint when and where substorms begin, thereby distinguishing between models that begin with current disruption in the near-Earth magnetotail and those that begin with magnetic reconnection in the distant magnetotail. The same array of spacecraft and ground observatories permits researchers to link phenomena observed in the magnetotail to those observed in the ionosphere. THEMIS employs flight-proven instruments and subsystems, yet demonstrates spacecraft design strategies ideal for Constellation class missions. THEMIS complements MMS and serves as a science and a technology pathfinder for future STP missions. THEMIS was launched on February 17, 2007. Energetic electrons within the Earth’s outer radiation belts pose a hazard to the safety of both astronauts and spacecraft. Understanding and predicting variations in the flux of these electrons remains a key objective of our national space weather program. 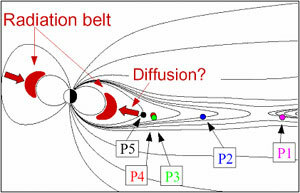 Although the magnetic field reconfigurations that occur during substorms dump copious quantities of energized particles into the radiation belts, other mechanisms have been proposed. These include in-situ energization by VLF and ULF wave activity, steady diffusion and energization of the cold plasma sheet population, and acceleration by the passage of interplanetary shocks. The multipoint THEMIS observations will help distinguish between these mechanisms by (1) tracking the motion of particle injection fronts through the magnetosphere, (2) determining radial gradients in phase space density that can be used to discriminate between the proposed models, and (3) determining the extent of the wave fields that are proposed to accelerate the particles. To address these research objectives, THEMIS will work closely with researchers in the geosynchronous programs of NOAA and the Department of Energy. The 5 THEMIS spacecraft will measure radial gradients in phase space density. 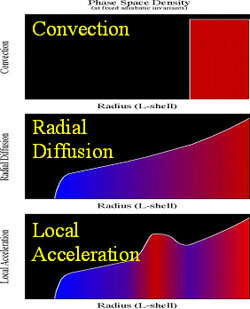 These gradients can be used to distinguish between convection, radial diffusion, and local acceleration, three proposed mechanisms for the generation of the radiation belts. During the first summer season (May-September 2007), the THEMIS spacecraft will be arrayed like pearls on a string following identical orbits with apogees in the dayside magnetosheath. With separation distances ranging from 100’s of km to one Earth radii, the spacecraft will make observations on scales suitable for studies of reconnection micro- and meso-physics, magnetopause boundary layer structure and motion, and wave propagation in the magnetosheath. During the second summer season (May-September 2008), the THEMIS spacecraft will be arrayed in orbits, which permit them to simultaneously observe the pristine solar wind, foreshock, magnetosheath, and outer magnetosphere. This configuration is ideal for determining how kinetic and magnetohydrodynamic processes in the region upstream from the Earth modify the nature of the solar wind-magnetosphere interaction. In particular, the observations can be used to determine the characteristics of hot flow anomalies and diamagnetic cavities within the foreshock, the propagation of transmitted solar wind discontinuities through the magnetosheath, and to search for solar wind triggers of magnetopause instabilities.